I have a problem with meatballs. I mean a is there rehab for meatballs problem. My wife does not share the same affection for the meaty goodness. I find the one Italian on our beautiful planet who does not enjoy meatballs. But she loves this recipe, which makes my heart flutter. This is possibly my favorite recipe for meatballs, they are soft yet have this crunchy brown outside. Cayenne makes them spicy in the best possible ways. The kick is in both the sauce and meat, creating an excellent coupling of savory flavors. You can adjust the spice level in this recipe if you enjoy your taste buds intact. I failed to mention the most important aspects of these meatballs… They are healthy. Healthy does not need to be a flavorless mockery of food. You can bring all the wonderful zings about flavor to healthy meals. Food for me is glorious…but glorious doesn’t always fit into pants. My wife and I are embarking on this wonderful adventure of living a healthier life style. So, what better way to start than with our food. Prep- Preheat oven to 350°. Chop the cilantro, garlic and crackers. Set aside a few pinches of the cilantro for the sauce. Dice the onion and save for sauce as well. 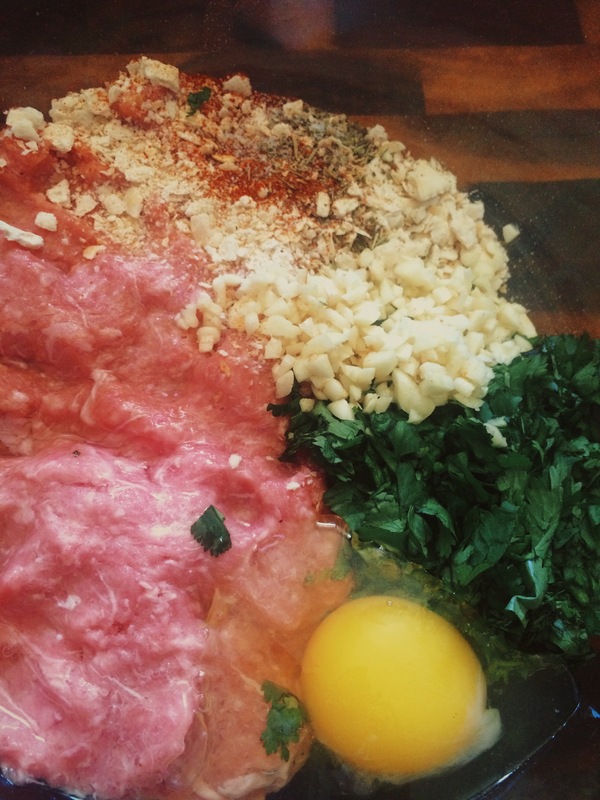 Mix- In a large bowl toss the ground turkey, eggs, garlic, cilantro, saltines and spices. Mix all the ingredients with your hands until everything comes together. Do not over mix because the meatballs will toughen, you want to see the bits of garlic and even saltines. Use an 1/8th cup to measure out the meat mixture. Gently form your meatballs, this mixture will make about 12 meatballs. Bake- Place your meatballs into a baking dish. I do not oil the dish, the meat creates natural fat that releases during the baking process. You are more than welcome to lightly coat your dish if you are afraid of them sticking. Bake at 350° for 20-25 mintues. You want them to have a crust like shell but still have a slight spring to the touch. Cook- While the deliciousness ensues in your oven, it’s a perfect time to create the sauce. Coat a pan with oil, over medium heat add the diced onions. Once the onions are soft and translucent, add your fire roasted tomatoes. Smash the tomatoes with the back of a wooden spoon, then add the tomato sauce. Allow sauce to come to a light boil then lower your heat. Add your seasonings and cilantro. Cook on low for about 10 minutes. Eat: Once your meatballs are done toss in the sauce and serve over a bed of rice or pasta. I prefer orzo!